Many recipes in older cookbooks instruct you to rinse or soak chicken before cooking it, but the USDA's Food Safety and Inspection Service, or FSIS, no longer advises this. According to the FSIS, rinsing poultry does little to remove harmful bacteria and actually increases your chances of spreading them around your kitchen. Any bacteria in the chicken are killed when you cook the meat. 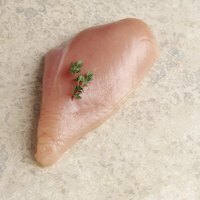 Skinning chicken tenders is also unnecessary, because the bacteria come from the inside of the chicken breast. To prepare chicken tenders, remove the thick tendon that runs down their underside. Grasp the top of the tendon with your non-dominant hand, and pull it away from the meat. Press the tip of a sharp boning knife into the place where the tendon and meat join. Cut the tendon free from the meat. Continue pulling the tendon to keep it taut, and slice slowly down its length with the tip of the knife. Keep your knife against the underside of the tendon to avoid cutting off strips of meat. Discard the tendon. Pat the chicken tender dry with a paper towel to remove excess packaging liquid, if there is any. Repeat with the other tenders you plan to cook. Prepare and cook the tenders as desired. At the end of the cooking time, check the meat with an instant-read thermometer to ensure that it has cooked to a safe temperature. When the thermometer reads at least 165 degrees Fahrenheit, any bacteria in the chicken have been killed and the meat is safe to eat. Good Housekeeping: Should I Wash Chicken Before Cooking?